Kumasi, Nov. 10, GNA - Otumfuo Osei Tutu 11, Asantehene, has called for stiffer punishment for those caught in possession of illegal firearms. This, he said was necessary as the country could not afford to pretend to be far away from the trouble spots of the West Africa sub-region. Otumfuo Osei Tutu said these in an address read for him by the Atipinhene, Oheneba Osei Agyeman Badu, at the launch of the campaign on small arms and light weapons in Ashanti at the Ghana National Association of Teachers (GNAT) Hall in Kumasi on Wednesday. It was organised by the Ghana National Commission on Small Arms with support from the United Nations Development Programme (UNDP). Members of the security agencies, chiefs, religious leaders, teachers, civil society organisations, students and school children were among those who attended. 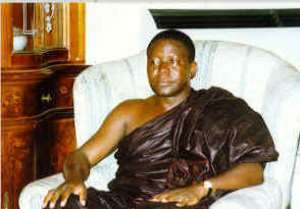 Otumfuo Osei Tutu was abhorrent about reports on school children carrying guns to school these days and the pulling out of guns at one another by married couples and blamed this on the copying of cultures that were not in the interest of the nation. "We have to look at ourselves, set our own standards and priorities", the Asantehene added. He advised chiefs to join the fight against the proliferation of small arms by educating people in their communities on the dangers of those arms. Mr Thomas Broni, Deputy Minister of the Interior, renewed the appeal to the people to alert the authorities of those they knew to be in possession of illicit small arms. He pointed out that wealth creation could not co-exist with violence and condemned the situation in the past where weapons were issued to those who were not supposed to carry them. Mr Maxwell Kofi Jumah, Kumasi Metropolitan Chief Executive, told Ghanaians not to glorify violence, saying, they must always insist on responsible conduct from all. "The rule of law should not be a shouting slogan, it must become a firm principle that is non-negotiable," he stressed. Nana Frema Busia, Technical Adviser and National Co-ordinator of the Commission, said the mandate of the present generation should not be blood spilling but a mission of development.